Hello, Mai here! It's Friday + thank you so much for joining us again for another blog post! Today's post is going to be on a few products from Instytutum, a Swiss beauty brand that describes itself as "the perfect union of the latest science, technology and high-performance actives. Providing highly-effective and innovative skincare products is our #1 priority in order to create FLAWLESS SKIN." I have to admit, when Instytutum contacted Dax and I about hosting a giveaway with us, I was a little skeptical. I had never heard of the brand before, and I wanted our first giveaway to be special and personal. Dax and I had planned on curating a set of products ourselves, but when they reached out to us and asked us to try out their serum, toner, and eye cream (which - had we fallen in love with the products - would later become the subject of the giveaway), we figured we would give it a fair shot! I want to start out by saying that this is 100% next-level skincare. This is holistic skincare science that has been carefully formulated. 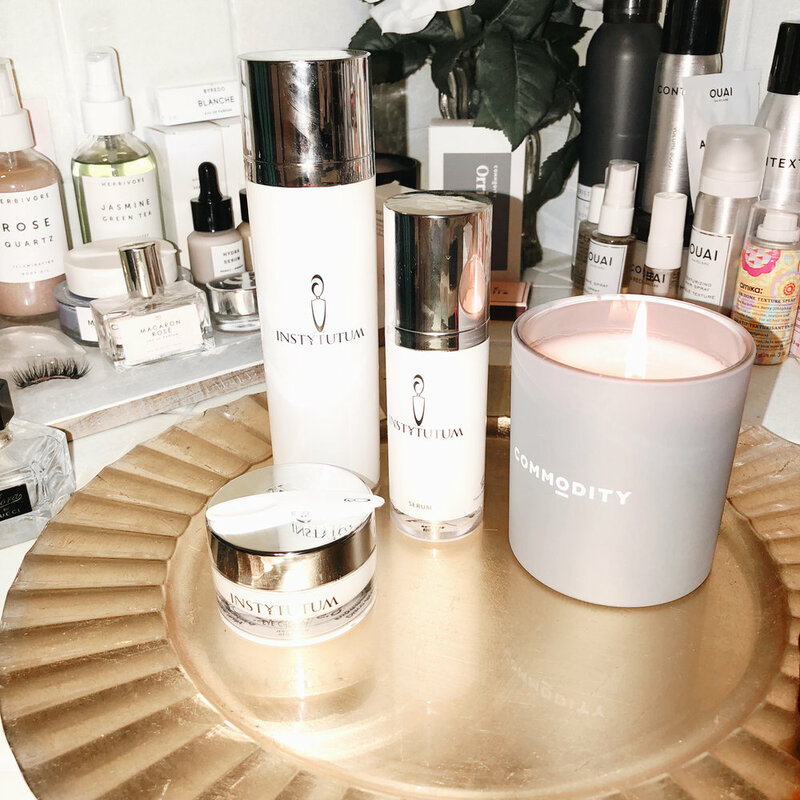 This brand heavily focuses on anti-aging, so if that's what you're focusing on or interested in when it comes to building your personal routine, then this would be the perfect brand for you. First of all, the packaging is luxurious, heavy, and minimalistic. (Also very photogenic if that matters to you). And, I'm not kidding when I say this: I use all three of these products every single morning. I thoroughly believe in this brand. Let's talk about the products in normal order of use: toner first. The Resurfacing Glow Toner retails for $59, and you get 4.6 oz of product. The packaging is minimalistic - white and silver, which looks perfect sitting on your vanity or in your medicine cabinet. A little of this toner goes along way, and this was the first product from Instytutum that I fell in love with. It’s very soothing on the skin, and creates an immediate glow. This product claims to: remove dead surface skin cells, comfort the skin, hydrate, refine texture, and even skintone. Sign me up! Ingredients include: glycolic acid to resurface + refine pores, camomile extract to soothe + moisturize, provitamin B5 to protect + restore, allantoin to soothe + heal, vitamins B3, E, and A. With an impressive ingredient lineup like that, I was expecting this to work for me, and it has. I’ve been using it daily for about … 3 weeks maybe? And I’ve loved it so far. This has helped with texture, redness, and makes my skin so, so soft. Dax and I swear by this. I tone right after cleansing, before I go in with any sort of serum or masking product. I use a cotton pad to sweep this all over my skin in an upward motion! The Anti-Wrinkle Brightening Serum retails for $119 for 1oz of product …. I know, I know. Not easy on the wallet. This product claims to: increase moisture (and when used along with the toner, the results have been incredible), diminish dark spots, improve firmness and radiance, reduce pore size, and minimize the depth of fine lines + wrinkles. Sheesh. This serum is packing a punch. It also claims to combine collagen-stimulating peptides and advanced anti-aging property with potent plant stem cells. Which, is incredible to me. So much thought and energy was put into each of the ingredients included in these products. Vitamin B3 and time-released Vitamin C rejuvenates + diminishes the appearance of dark spots and wrinkles. There’s also this really cool ingredient that they label as the “Spotlight” which is, “a liposomal combination of Swiss cress extract and soy isoflavone that reduces the pigmentation of age spots without effecting the surrounding skin”…… HOW? I don’t really have many age spots / dark spots, so I can’t exactly attest for this, but sheesh. Intense. You can click here to see a full rundown of the ingredients and their benefits. They explain it better than I ever could. Like I mentioned, pairing this with the toner has been life-changing for my skin. My skin has been GLOWING and so, so hydrated (but NOT overly oily / greasy - just a healthy hydration). These two together = power couple. Last, but absolutely, 100%, not least: eye cream. I had been searching for an eye cream that didn’t give me milia, dammit. I don’t know why so many eye creams tend to irritate my under-eye area, but I was getting really frustrated. But then, I tried this one. The Ultimate Anti-Wrinkle Brightening Eye Cream, which retails for $89 for 0.5oz of product. This eye cream claims to diminish fine lines and wrinkles, just like most of the products that Instytutum offers. It also claims to diminish the appearance of dark circles, smooth, brighten + tighten. Everything you could ever ask for in an eye cream. Ingredients include: a collagen synthesis-stimulating peptide which “mimics the body’s own mechanism to produce collagen”, caffeine, retinol, berryflux vita (an extract of raspberry cultured stem cells with strong antioxidant properties - improves the skin’s elasticity and increases HA content), and cellpulse - which “enhances skin structure and diminishes loss of lipids”. I’ve recently been looking for an eye cream to help with these annoying dark circles that I’ve developed the past couple of years. They kinda just popped up out of nowhere (probably bc of stress), and I haven’t been able to get rid of them. They’re what prompted my search for The Perfect Eye Cream. However, like I mentioned earlier, milia was the outcome of most eye creams that I tried. There are a couple that I can use, though (ie: the Context Skin one), and now this one! The packaging is quite large for only 0.5oz of product, and it comes with a spatula for… you know… hygienic reasons. One thing I notice when using this is the immediate plumping effect this has on my under-eye area. It brightens and makes everything just look … smooth and awake. As far as fine lines go, I don’t really have any (YET), so I also can’t attest for that. But for brightening, I’d give this a huge YES. My dark circles aren’t really less visible upon initial application, but I will say that using this consistently has helped them lighten a tad bit over time. I’ll continue consistent use and keep you all posted! Dax and I have been thoroughly enjoying these products, and because of that, Instytutum wants to give away all 3 of these products to one of our readers! This is roughly a $267 value, and I honestly think that every single one of these products are amazing. You have the chance to win them for no charge ….. and I absolutely wouldn’t pass that up. You can enter by following the instructions on the giveaway post on our Instagram (@THEGLOSSARRAY), and it ends TOMORROW (3/17), so make sure to get your entry in before it does! Entering is super simple and only takes a few moments, so there really is no reason to NOT enter. That’s all for this weeks post, I hope you all enjoyed! Once again, thank you so much for 4k followers, we are overjoyed and so grateful. We can’t wait to see where things go from here!